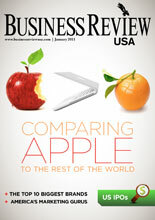 SAN DIEGO, CA--(Marketwire - January 20, 2011) - Business Review USA, the top digital media source for American business news, takes a look at the latest MacBook Air as a status symbol and a testament to the Apple customer culture. What's so special about MacBooks that Apple can get away with charging upwards of $1400 while PCs go for nearly half the price? Are Macs twice as good as PCs? Because that's what the price tag is saying. Here is my attempt at figuring out what the hype is behind the MacBook Air and other iMacs and how they size up to competitors in the PC world. "From childhood, we're taught that certain brands are superior and are made to show off to our friends. And if we don't don these brands and products, our peers will think less-highly of us. This is true when it comes to electronics. While consumers may say that it's their choice when it comes to the brands, operating systems and software they buy, what they really want to say is, 'I really didn't want to spend almost twice as much for a MacBook, when I could buy a similar laptop under the HP, Samsung, or Sony brand for less.'" Read more at http://www.businessreviewusa.com. Business Review USA is a leading digital media source of news and content for C-level executives focused on business and industry-specific news throughout the United States. Business Review USA is the territory-dedicated arm of the White Digital Media Group. Founded in 2007 by entrepreneur Glen White, White Digital Media retains a diversified portfolio of websites, magazines, daily news feeds and weekly e-newsletters that leverage technology to innovatively deliver high-quality content, analytical data, and industry news. Business Review USA is headquartered in San Diego, California, with an additional office in Boston. For more information, contact 1-760-827-7800 or visit http://www.BusinessReviewUSA.com.